Here’s a tasty and versatile salad that can be a main dish or a side dish. It is adapted from a recipe in Bonnie Stern’s cookbook More Heart Smart Cooking and is one of my personal favorites. I’ve added the cucumber and radish and added a few more chickpeas to use up the second can! More Heart Smart Cooking is one in a series of cookbooks that was written in conjunction with the Heart and Stroke Foundation of Canada. While the couscous is sitting, chop your bell peppers, green onions, cucumber, radishes and cilantro. Once the couscous is ready, fluff with a fork. 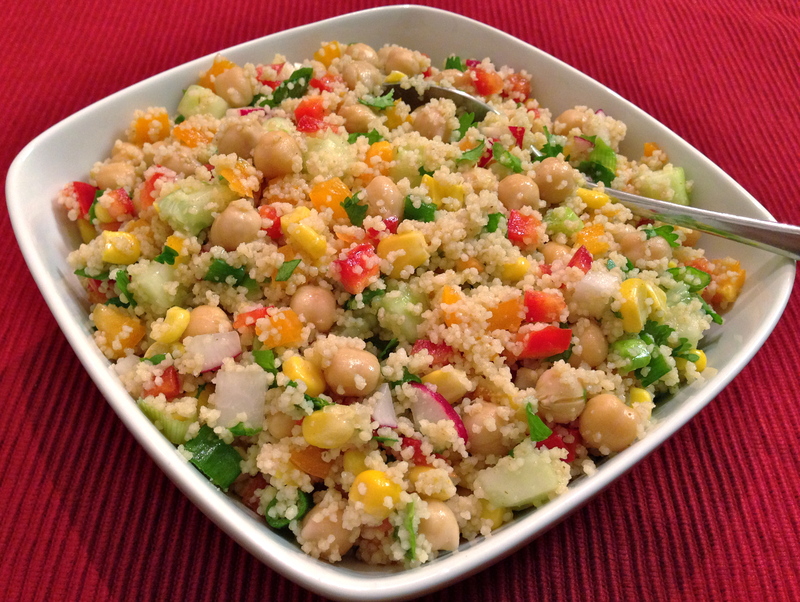 Place couscous, bell peppers, corn, green onion, cucumber, radish, chick peas and cilantro in a large bowl. In a small bowl mix the dressing including sweet and hot thai sauce, cumin, honey, cider vinegar, lime juice, orange juice and olive oil. Today I didn't have any orange juice so I just doubled the lime juice and it turned out quite delicious. 🙂 So don't worry about mixing the ingredients up a little bit depending on what you have in the house. Toss the dressing into the salad and serve!